Terry Lopez with CCSCT’s Child Care Services Program and Vangie Garcia with CCSCT’s Community Services Program partnered together to raise $2,175 so that low-income families in Medina County could provide Christmas gifts for their children this year. In addition, Colonel Jesse Perez made a personal donation to the cause. After funds were raised, CCSCT staff gathered at the Walmart in Hondo on December 20th to shop for 19 families consisting of a total of 53 children. $40 was spent on each child and gifts were also donated to the Women’s Shelter from the hospital. Most of the families met CCSCT staff at Walmart to shop for the children. The families that could not attend provided lists of items that each child wanted to the staff and the staff teamed up and shopped for the children. Later that afternoon, lunch was provided to all the families, CCSCT staff, and Colonel Jesse Perez. 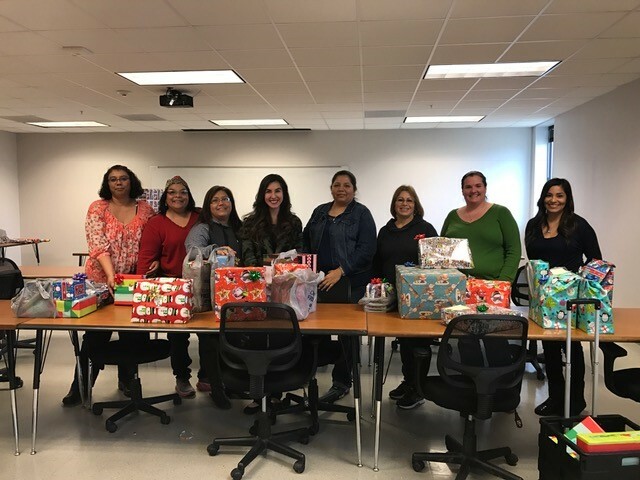 CCSCT also provided wrapping paper, boxes, tissue paper, scissors and tape so that the families could wrap their gifts prior to taking them home. Danielle Figirova- My favorite part was seeing the families happy while they shopped and wrapped their gifts. Just knowing some of their background and why they needed the assistance was so worth the opportunity to help!! Nilda Yzaguirre- My favorite thing about the Christmas Project is knowing that there will be 53 children in Hondo with smiles on their faces and a happy heart and soul because there is a SANTA. Clarissa Dominguez- I am glad that these families were able to be helped. It’s good to know that some of the stress has been taken off of the parents and their children are taken care of for Christmas. I enjoyed helping choosing gifts for the children. Teresa Lopez- My greatest joy was seeing the faces on the parents on how grateful they were to receive assistance. The coming together and showing unity we have among others. Rosa Powell- My favorite thing about the Christmas project was that the families got to shop and pick their presents they wanted for their children. Julie Cantu- My favorite thing about this project was seeing the faces of true, genuine gratefulness. One family, grandparents who have seven of their grandchildren, were so grateful for the help we gave them. It made me realize how blessed we are and glad that I was able to give back. Caroline Herrera- knowing that even though these families were going through some things, the children were going to be taken care of. I think, as parents we always want to try our best to keep our children protected and happy and so it was great that we could help these parents provide that for their children.